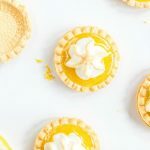 These easy Lemon Curd Tartlets are flaky, mini pastry tart shells filled with homemade lemon curd and topped with meringue that is lightly toasted. Fill the tart shells with lemon curd (about 2 teaspoons each). In the bowl of your mixer add room temperature egg white, cream of tartar, and vanilla extract. Whisk on medium until soft peaks form (the peaks will fall over when you lift the whisk up). Add sugar 1 teaspoon at a time, continuing to mix on high speed until all of the sugar is added and the meringue forms stiff peaks (the peaks stand up straight when you life the whisk). Place the meringue in a piping bag to pipe on top of the lemon curd tartlets or just drop a dollop on each one with a spoon. Bake in a 400 degrees F oven for 2-3 minutes or until the meringue just begins to brown. Let the tartlets cool to room temperature then place in the refrigerator and chill for at least 1 hour or until ready to serve.